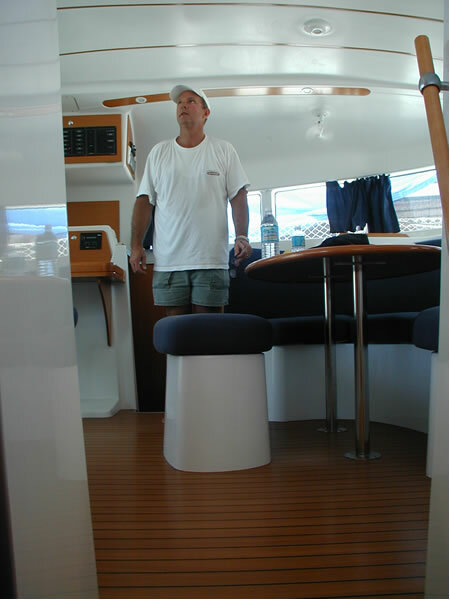 These are pictures from our trip to Fort Lauderdale in early July, 2003 for the initial inspection, survey, and sea trial of our boat prior to negotiating the purchase at the end of July. 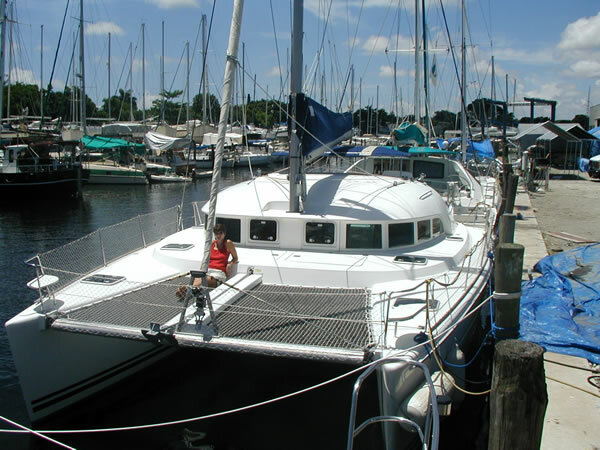 We had already been to Fort Lauderdale a few weeks before and seen numerous catamarans in the Ft. Lauderdale area. 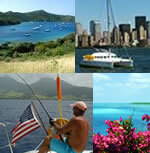 We had narrowed the search to the best Lagoon 380 we could find. 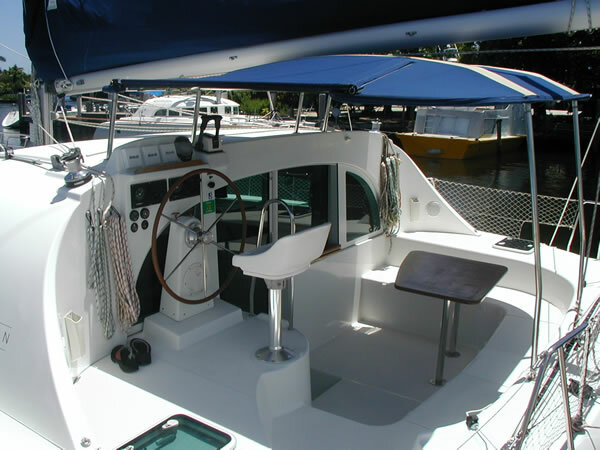 The following photographs and comments were produced as a result of the initial trip to actually "test drive" the boat and have it appraised by an expert prior to making an offer. 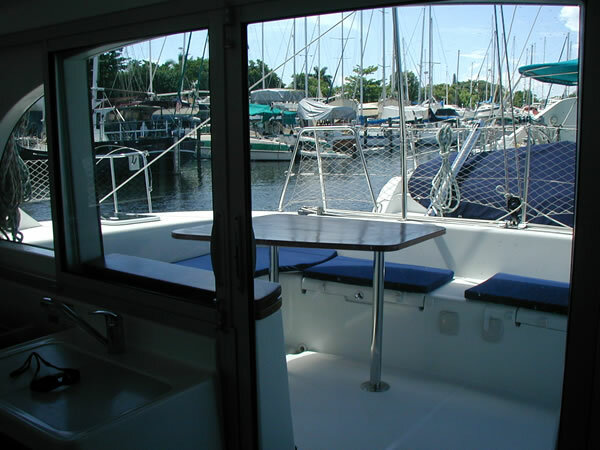 The layout of the boat is an "owner's version." Diesel generator mounted in a forward locker and outside the living quarters. 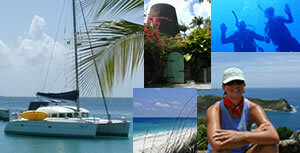 It is a 9.5 kw generator, so if there is a need to throw a KISS concert at Norman Island in the BVI, we're ready. The generator only has 40 hours on it. It has a soft cover, sound shield that is folded back here for inspection. 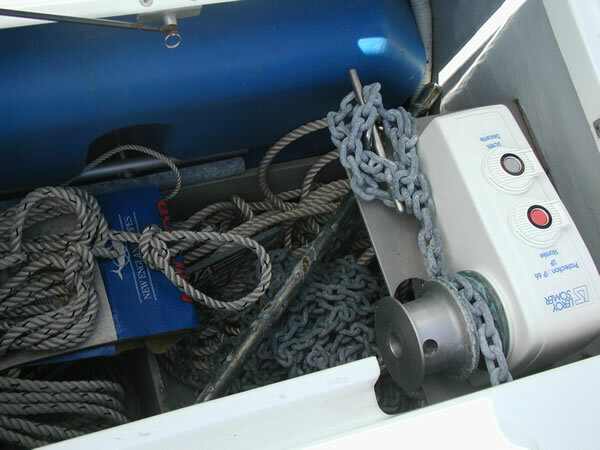 Starboard locker with electric anchor windlass, a hundred feet of chain, lots of rope, and a spare anchor, etc. The blue tank is a water tank and there is an identical one next door in the locker with the generator for a total of 160 gallons of water. This is a shot of the cockpit from inside the main salon. 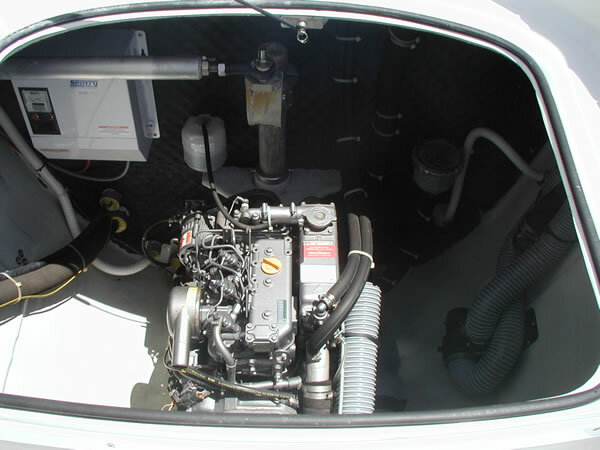 One of the Yanmar 27 hp diesels. 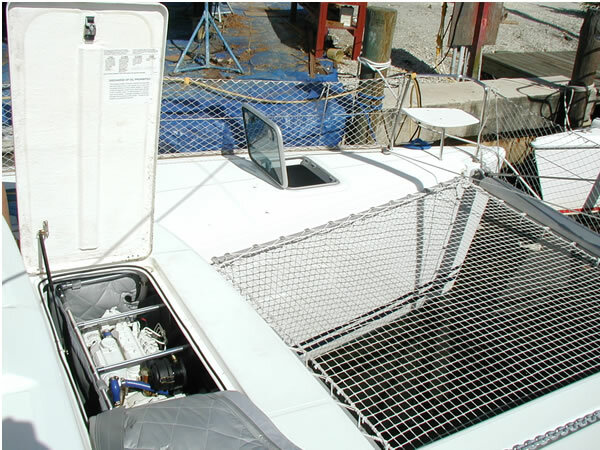 There is one in the aft of each hull and, as you can see, there is a firewall that separates the engine compartments from the living quarters. The engines had 300 hours on them at the time of the survey. 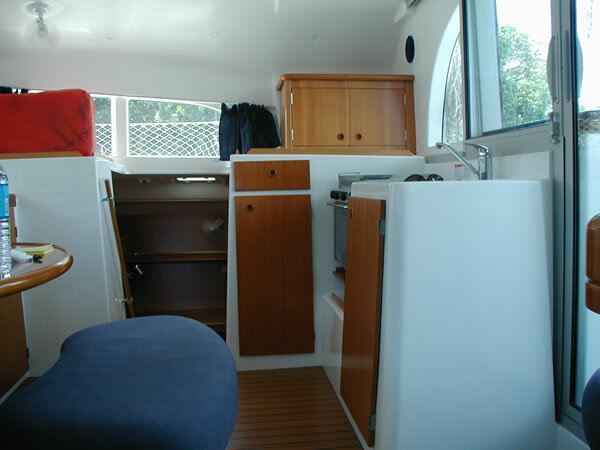 View of the bow of the boat. We were lucky enough to catch the Admiral lounging on the trampoline. 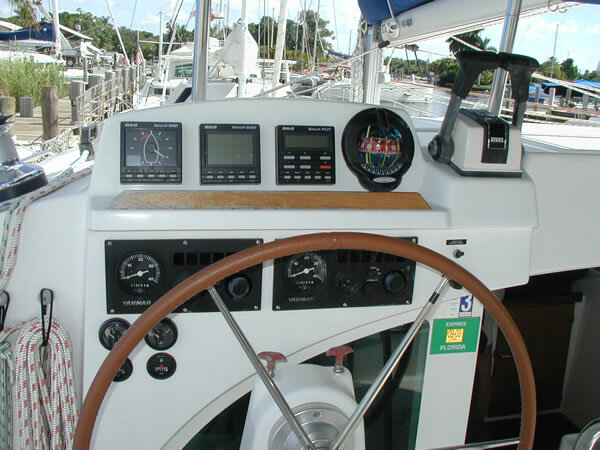 Another view of the helm and the aft cockpit. 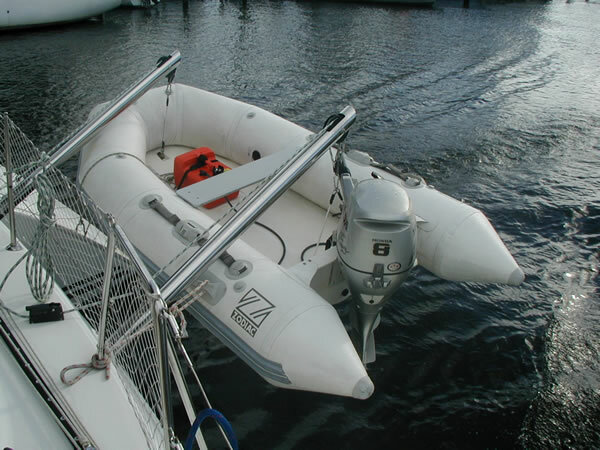 As you can see, the dinghy is a Zodiac and has an 8 hp 4 stoke Honda outboard with 10 hours on it. There is also a complete blue canvas cover that was removed for the survey. 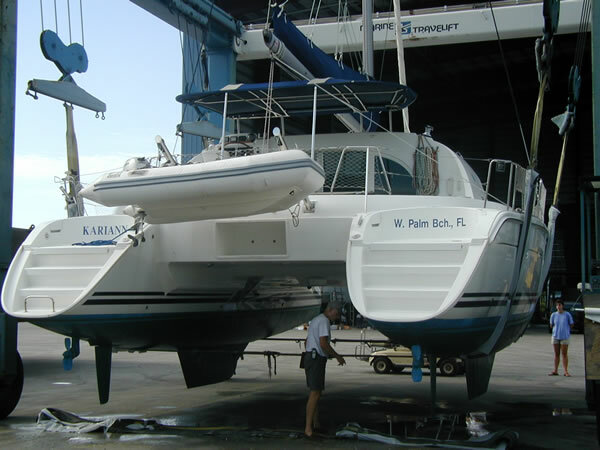 There is talk about hanging our Miata on the davits instead of the dinghy (if only the Miata could swim). Hanging in the slings at Fort Lauderdale Marine. That's the surveyor, Brian Stetler, looking her over. As you can see, the Admiral looks on from the starboard bow. 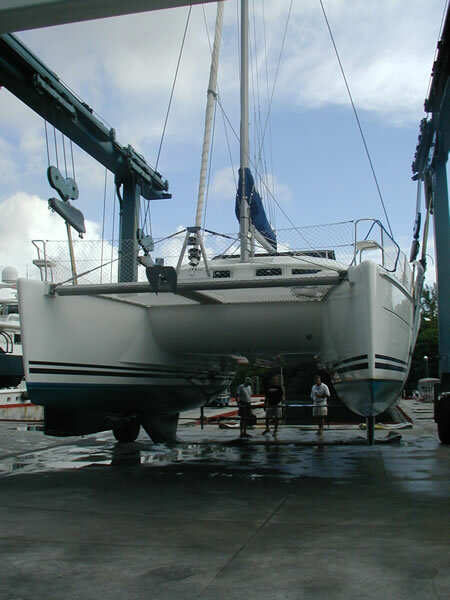 Another shot of her hanging in the slings just before being splashed gently back into the Las Olas River for sea trial. 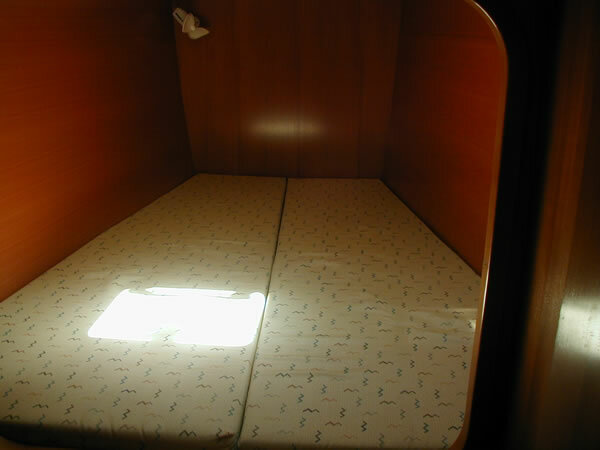 One of the aft berths. 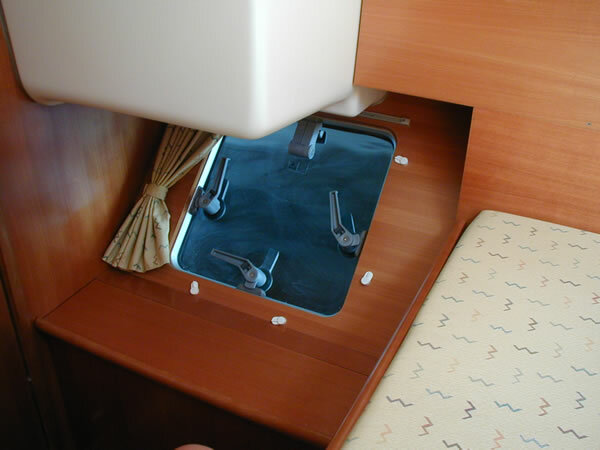 An escape hatch in one of the aft berths. 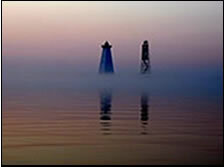 There is one in each hull so that you can get in or out in the event of a capsize. Forward berth in the port hull. Main salon showing galley and stairway down into the starboard hull. 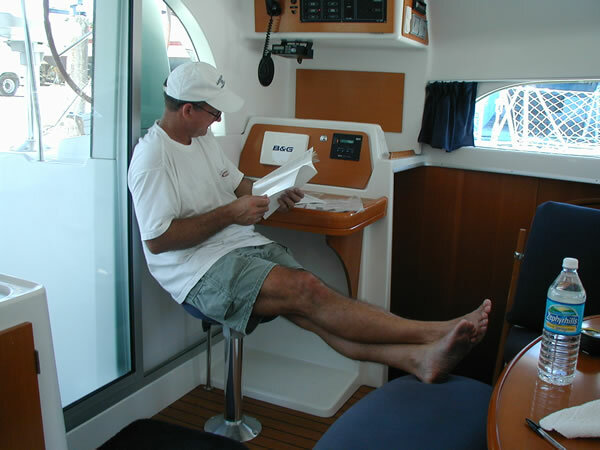 Buddy trying to estimate exactly what hydrodynamic properties the roof has in the event we have to sail it upside down! Yikes! 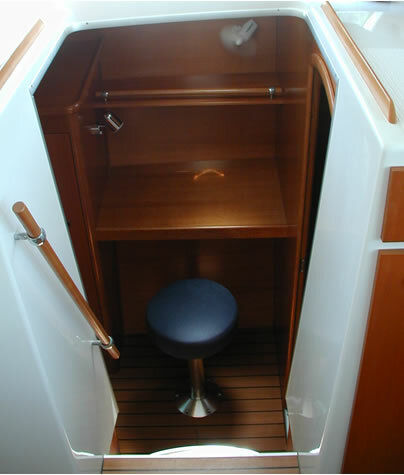 Shower in the owner's hull (starboard hull). 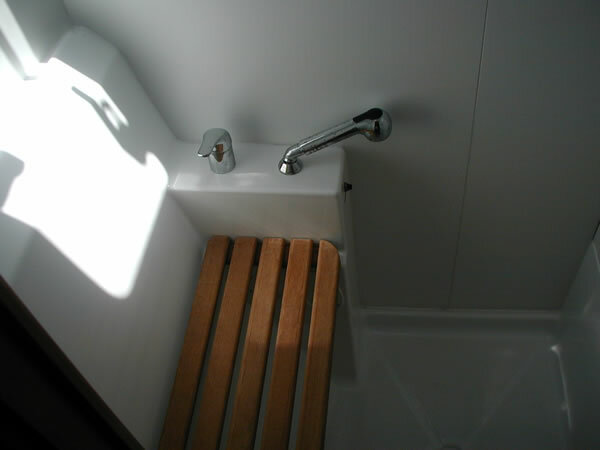 It is as big as the shower in our house, complete with shower seat. 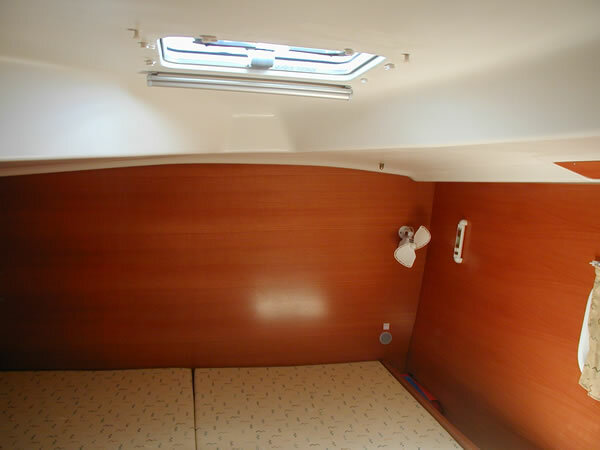 The head room is 6'5" here and everywhere else in the boat. Stairway down into the starboard hull, showing the office area.